None injured in blast near Golan Heights as IDF determines whether it was a deliberate attack. An explosion was heard close to an IDF post near the Syrian border in the Golan Heights on Friday morning, patrols told Israeli media. The blast caused no injury or damage. 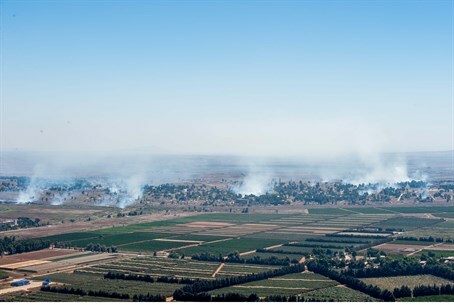 IDF officials are scanning the area to determine the cause of the blast, and to check whether it is spillover from Syria's civil war or a failed attempt to fire on Israel, according to Yediot Aharonot. One military source told Channel 10 in the minutes after the attack that the IDF estimates that it is, in fact, an attempt to fire a charge at Israeli forces. The IDF has yet to confirm this, however. While mortar shells and rocket fire from the region have characterized most of the Syrian-Israel border tensions, skirmishes along the border have been escalating. Friday's explosion surfaces days after Israel shot down a rogue Syrian Army fighter jet near the Golan Heights with a patriot missile - and after it shot down a Syrian drone after it strayed into Israeli airspace in August.